What a delicious combination! 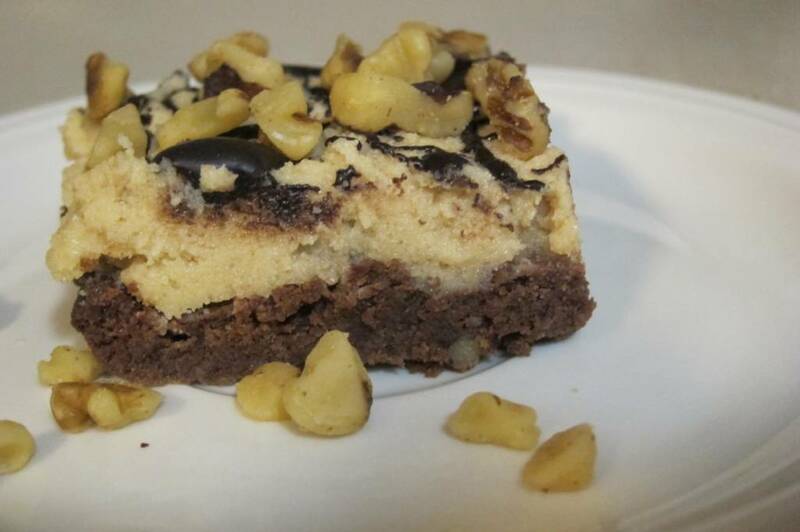 MOIST and chewy brownies topped with creamy chocolate chip cookie dough and then drizzled with more chocolate. This recipe was another “winner” for our family and the best part is…They’re fairly quick and easy to make. We thought they were even better after several hours in the refrigerator and even the next day, so it’s an easy recipe to make ahead of time. Since our family is on a three month ministry tour, we made these on our motorhome. This is how easy they are. They are virtually dairy free. (With the exception of butter. Beat eggs, butter, truvia, and vanilla until well mixed. Add the flours and everything else EXCEPT the xanthan gum and walnuts, and beat well. Slowly sprinkle in the xanthan gum while mixing, and stir in the chopped walnuts. Spread evenly into a greased 9x13 cake pan. Bake at 350 degrees for approximately 25-30 min. until just done. (Be careful not to over-bake!) Cool. Beat butter, "brown sugar" truvia, vanilla, almond milk, and egg until smooth. Add everything else EXCEPT the chocolate chips. Mix well and then stir in the chocolate chips. Spread on top of the cooled brownies. Drizzle with the melted chocolate and sprinkle chopped nuts on top. Refrigerate for at least a few hours and then cut into 2" squares.